Seasonless Staples Your Wardrobe Needs Now. A minimalist dress in a gorgeous desert neutral fabric begs you to slip into some jewelry. Elba wears a slip dress,Vince. Photographed at the Faye Sarkowsky Sculpture Garden at Palm Springs Art Museum in Palm Desert. Photograph by Fab Fernandez; Styling by Neil Cohen; Hair & Makeup by Chelsea Dorris. Droplets of color make a subtle cascade in the Marco Bicego Paradise Mixed Gemstone earrings at Leeds & Son Fine Jewelers. Some pieces prove more versatile than you might have guessed. Long diamond drop necklace in 18kt yellow gold at Leeds & Son Fine Jewelers. This sparkler says love, no matter which finger it is worn on. Double pear-shaped diamonds in intense yellow and white create dazzling harmony on this embraced ring set in 18kt white and yellow gold. As a rule for all of their jewelry, all diamonds more than 1 ct. are GIA Certified at Leeds & Son Fine Jewelers. Wound as a delicate sculpture around the wrist, the Mattia Cielo semi-precious gemstone and diamond wrap bracelet is a master of complements. At Leeds & Son Fine Jewelers. 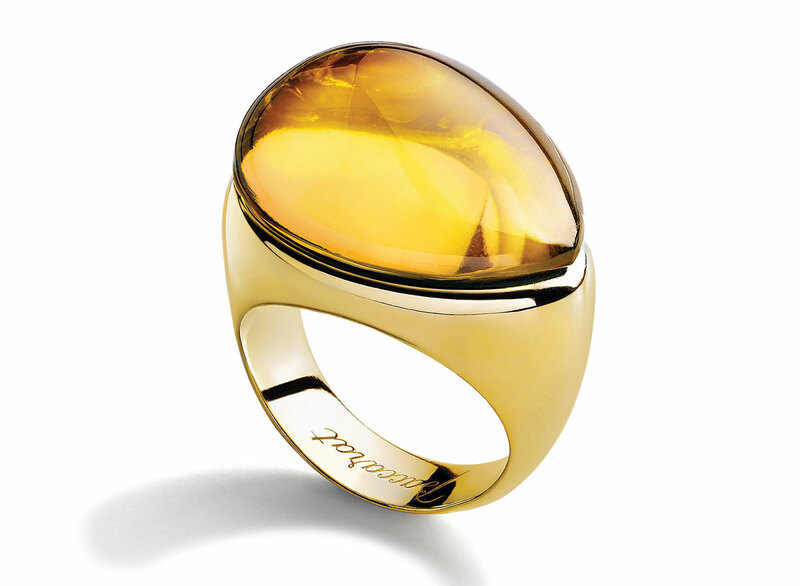 With its amber dome and wide band, the Galéa ring in Honey makes a sweet statement whether worn daily or on choice occasions. From Baccarat. When a black shoe won't do, reach for the bold, two-tone Flame Pump with graphic cut-outs. From Bottega Veneta. A woven cross-body strap adds versatility to the compact Tambura bag. 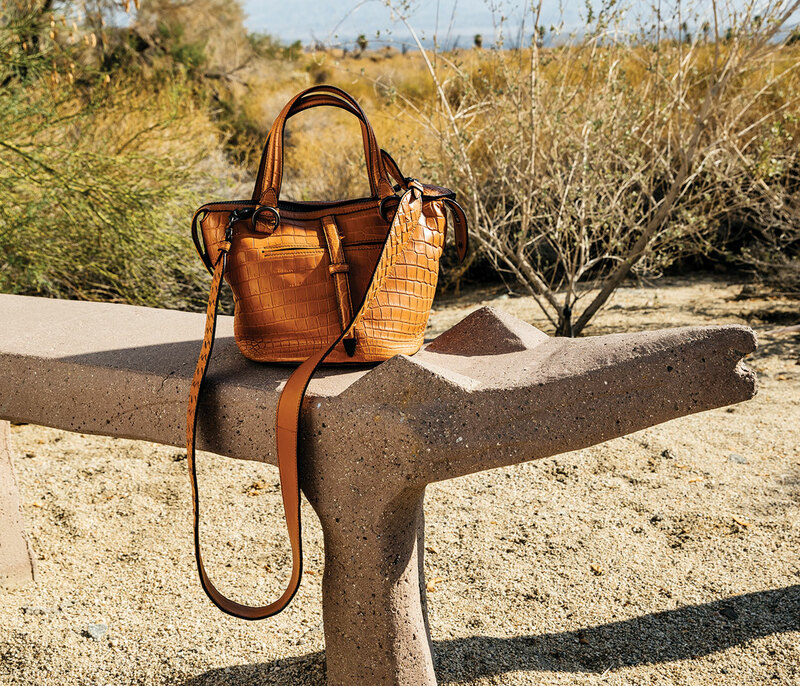 Newly debuted, it is crafted in traditional intrecciato nappa with oversize woven zipper pulls only from Bottega Veneta. Oblong links in gold and diamonds conjure the shape of a protective, allseeing eye. At El Paseo Jewelers. Loulou metallic, textured-leather ankle boots with a block heel and YSL logo are both 1960s and 2060s. Yves Saint Laurent silver ankle bootie from Saks Fifth Avenue Palm Desert. Still life photographs by Fab Fernandez; Ring courtesy Baccarrat; Bracelet courtesy El Paseo Jewelers.